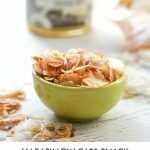 Cinnamon Vanilla Coconut Chips - a keto snack in just a few minutes! 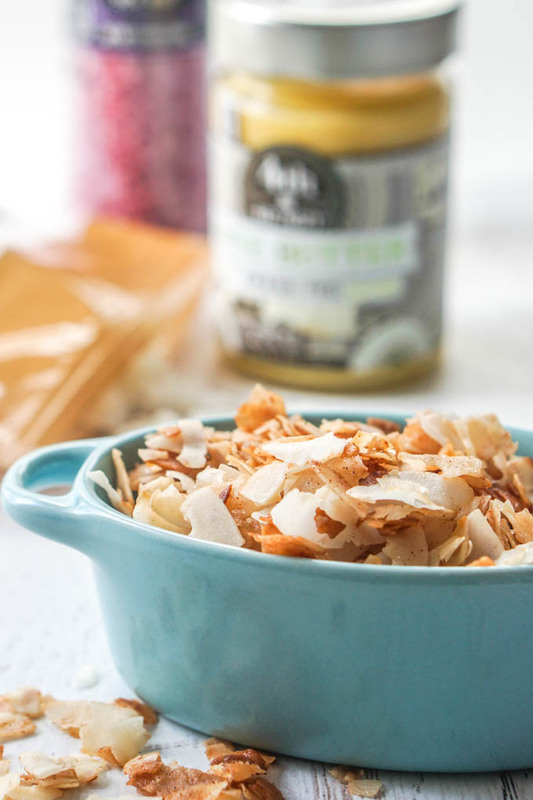 These cinnamon vanilla coconut chips are a quick and easy keto snack that you can make in minutes. With only a few ingredients you can make these low carb chips whenever the mood strikes. You might also like low carb chocolate coconut protein bites. 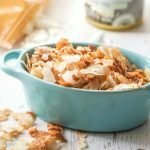 I remember awhile ago when I was doing a Paleo diet that I came across the idea of coconut chips. 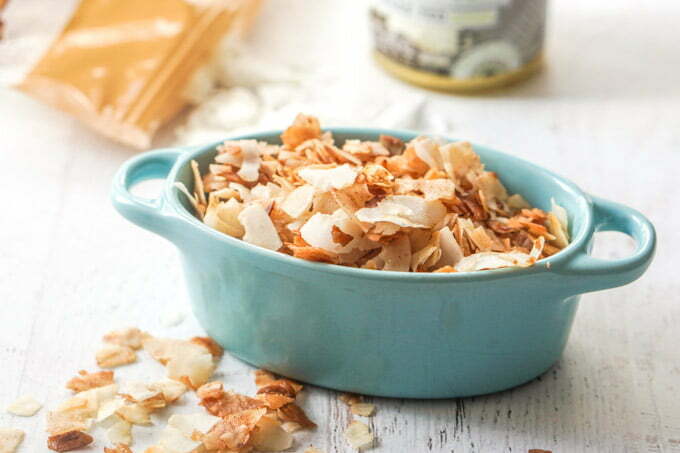 Over the years I have come to love unsweetened coconut, especially toasted coconut. That’s why I decided to make these toasted cinnamon vanilla coconut chips. It’s a simple keto snack recipe with just a few ingredients but let me tell you they are addicting! 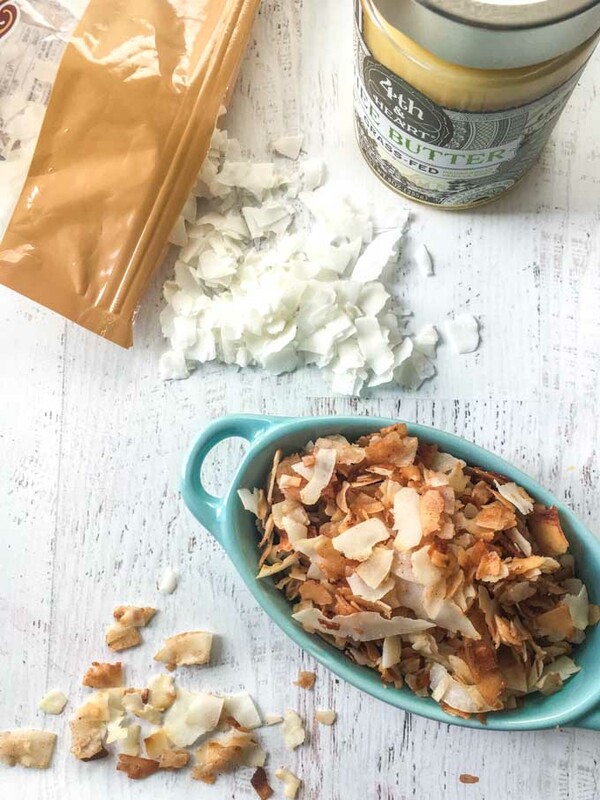 coconut flakes – I bought my coconut flakes or chips at Trader Joes. You don’t want the shredded kind but rather the bigger flakes. Also make sure that they are not sweetened. If you can’t find them at Trader Joes you can find them here on Amazon. 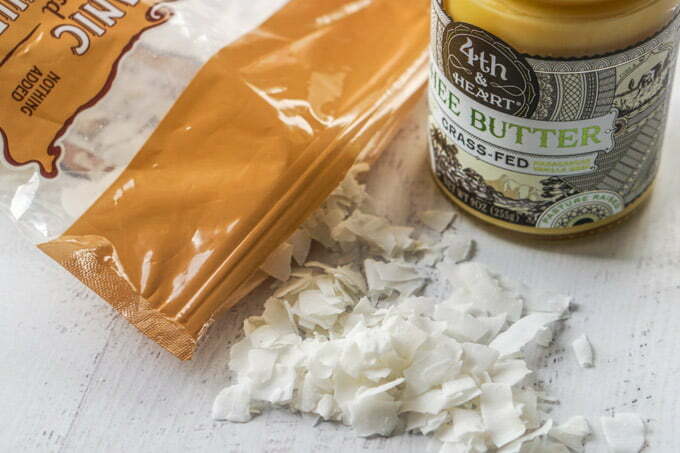 vanilla flavored ghee – Read below about this product. You can also use regular butter but the vanilla flavor was awesome. Swerve sweetener – This is my go to sweetener. cinnamon – Just regular cinnamon from your spice rack. I found this very cool ingredient on Thrive Market. Thrive Market is one of my favorite online stores—it sells all the top organic and healthy products at wholesale prices (25-50% off), and ships straight to your door! You can shop by different categories such as Keto, Paleo, Organic, Vegan, Gluten-Free, Non-GMO, Sustainably Farmed, etc. 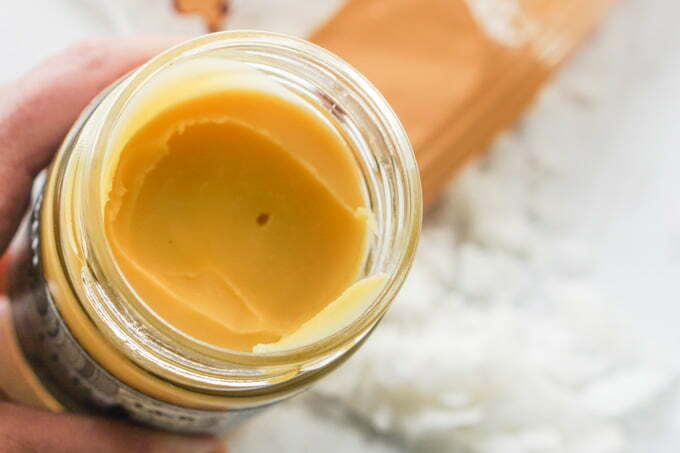 I bought a lot of Keto products to try out like this ghee. You can check out my Instagram Stories (Low Carb Buys) for more Keto products I bought. So I bought this Madagascar Vanilla Bean Ghee Butter. It is so smooth and creamy but infused with vanilla. It’s heavenly! You don’t need this of course, you can use regular butter. But if you use regular butter, put a little vanilla extract in too. This is super easy. Here’s how you make them. Add the ghee to a large saute pan and let it melt. Then add in the coconut chips, cinnamon, Swerve and a sprinkle of salt. Toast over medium low heat until your desired color. Make sure to watch them so they don’t burn. Lay them out on piece of wax paper so they can cool and dry. 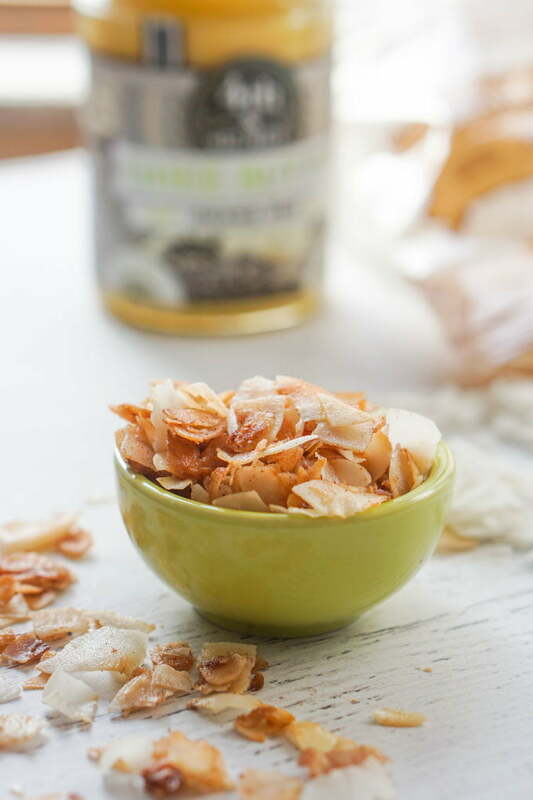 These cinnamon vanilla coconut chips are a quick and easy low carb keto snack that you can make in minutes. With only a few ingredients you can make these low carb chips whenever the mood strikes. In a large sauté pan, melt the ghee and then add in the rest of the ingredients. Stir and cook over a medium low flame until the coconut flake start to brown. Take of the stove and spread on a large piece of wax paper to try completely. * I used vanilla flavored ghee but if you use regular butter, add a bit of vanilla extra to get that vanilla flavor. You can find these products in my Amazon shop or on Thrive Market.